If the Source Monitor is active and you just have one clip in it (this is probably 99% of the time in most workflows) hitting T will mark an In Point on the first frame and Out Point on the last frame. Going back to our three-point editing from earlier, if you hit Splice-In or Overwrite Edit this will edit the entire clip into the timeline at the time position indicator (the blue bar in the timeline) granted you don’t have an In or Out Point already on your timeline. If the Record Monitor is active, hitting T will put an In and Point around the common first and last frames of whatever tracks that are active. In laymen’s terms, if you just have V1 selected and you hit T, wherever the time position indicator is that clip’s first and last frames will be marked. This is very useful if you want to quickly Lift or Extract a clip. If you have multiple tracks selected, Media Composer will find the first and last frame that match up on those tracks. If they don’t have one then it’ll mark and In and Out on the first and last frames of the entire timeline. It’s kinda confusing, sorry. 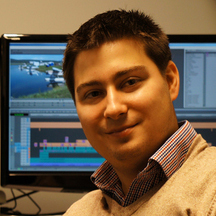 Try it out yourself in Media Composer and it’ll make sense in 30 seconds. When you hit D your In Point disappears. Hitting F will get rid of your Out Point. Pretty straightforward. This clears both In and Out Marks. Quick tip: If you are in a Bin and have a clip(s) selected, you can hit D, F or G to clear it’s In and Out Points. This is very useful if you want to clear them all on a bunch of clips for whatever reason. Just select them all in the bin, hit G and all the In and Out Points are gone. Use any of the shortcuts above to play and pause in the Source or Record Monitor. For me, I use Space Bar since it’s so darn easy. I also have changed my Tab and Tilde/Accent keys to perform different functions – Add Edit and Match Frame respectively. Hit 6 on the top row, not the number pad, to play from an In Point to an Out Point. Hold down Opt (Mac) or Alt (PC) to loop this. I use this often when my laptop is lagging for one reason or another. It helps playback because there is less data trying to be stored in my computer’s RAM. Hitting L will play just like hitting Space Bar, Tab, Tilde/Accent or 5 (top row) will. However, if you hit L again it’ll double the playback speed. If you hit it again it will speed it up again. If you are at 30FPS (Frames Per Second) the speeds will be: 30FPS (normal), 60FPS (double), 90FPS (triple), 150FPS and 240FPS. Play Reverse functions the exact same way as Play Forward but in the opposite direction, backwards. Using J-K-L is a very powerful and easy way to speed up your editing. Hit J or L as many times as you want and you can always hit K to pause playback whenever you want. Hitting K does the same thing during playback as would happen if you hit Space Bar, Tab, Tilde/Accent or 5 (top row) but if you are using J or L your fingers are all right there and it’s a little easier to use the keyboard in that way IMO. 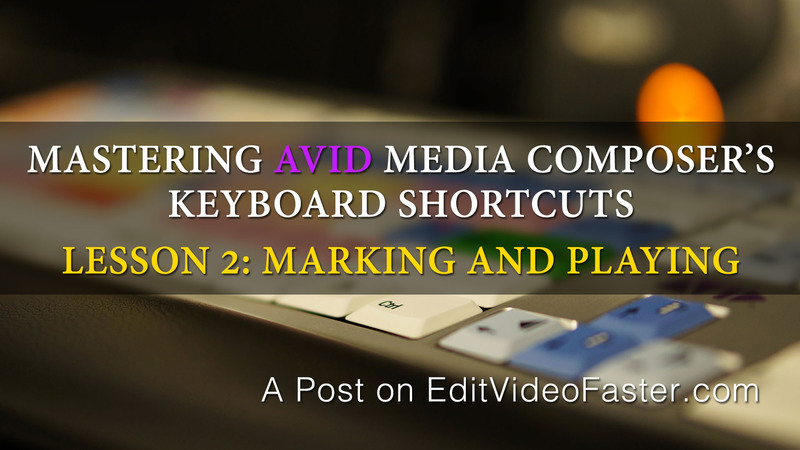 So that’s it for Mastering Avid Media Composer’s Keyboard Shortcuts Lesson 2 on Marking and Playing! In a few days I’ll be publishing Lesson 3. Make sure you’ve signed up to get emailed new posts (do this at the very bottom of this page!). Homework! Before moving onto the next lesson spend at least an hour in Media Composer working on a project and using the shortcuts you learned today. Mark In Points and Out Points and try out Play Forward and Play In to Out. Practice, practice, practice! Give me a shout if you have any questions on any of this in the comments below or through my Contact Page. I’ll see you in a couple days with Lesson 3!